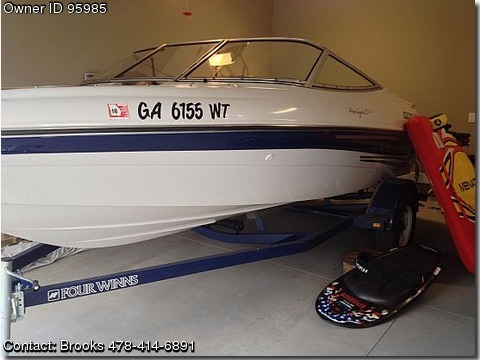 Call Boat Owner Brooks 478-414-6891. Description: This is a 16'6" 2000 Four Winns 170 LS Horizon 25th Anniversary edition Ski Boat with many extras for sale. This boat is very very clean and only has 149 total hrs. Has only been dry stored and very well maintained. Boat has 4.3L Volvo inboard/outboard engine, glove box, and built in cooler. This sale includes many extras including a boat cover which I have used to travel with without any problems, practically new tube, knee board, 2 ski ropes, 3 nice life jackets, 2 nice dock tie ropes, brand new kenwood cd player with aux option to plug in phoneipod, boat contains 4 upgraded JBL speakers with amp sounds great, 2 anchors...plus more. Trailer has good conditioned tires approx. 1 year old and a detachable tongue for easy storage easily fits in my garage. Boat runs great and is riding ready, all you have to do is unload it and go. I used it a few times this summer with no problems. For all the specifications visit this website httpwww.fourwinns.comuploadDocumentsOwnersManuals2000170-180-190-Horizon.pdf Only selling due to a recent move. Asking 9500 OBO reasonable offer, serious inquirers only please.